I've not seen the fireball shot from boss as of yet. I only beat boss on level 1 and 2 so far. Perhaps only boss 3 shoots fire? I will try again tonight in case I'm remembering wrong. See how the ghost launches a flame every once in a while? You should see the same in your game. If you are sure you don't see those flames please record a small youtube and post the link here. Edited by Kai_Magazine, Mon Mar 4, 2019 11:05 AM. Here is the video from boss 1. No flame. I'm using Sears Intv NTSC. I will say I have seen the strange can't jump issue again. I have tried a different joystick. It does not happen all the time, but it does happen. That is odd, we will investigate. It looks like Sears has a different exec. Do you have a stock intellivision to test the game with? Edited by Kai_Magazine, Mon Mar 4, 2019 12:21 PM. I will post some of my thoughts when I have time (I love the game! ), but reading the manual now I have to ask, are the ghost bosses supposed to have their flame attack on all difficulties? I played through 3 rounds and none did. Hi Black tiger, did you play the game on a Sears intv? Do you remember if you did a reset to the console before you started playing again? Also, could you play until you reach the first boss by just turning on the console and not making any reset, and see if the boss fires flames at you? Same boss no flame issue with reset or no reset on Sears. I'm going to try original 2609 model and Intv2 now. Jump button issue is harder, as it does not happen every time. I can sometimes get a black line in the Soul meter a top of the screen, but its just a quick graphic glitch and does not really seem to matter at all. Thank you very much, grips! I will be offline for 8 hours or so since it is very late at night here, but I will check this thread first thing in the morning. I apreciate your help a lot, guys! Same issue on 2609. No flame shot for first boss. Going to try Intv2 now. No Boss flame shot on Intv 2 either. These are all the NTSC models I have. I have a PAL unit here, should I test on that too? No, there is no need, I have a Pal console myself. It seems clear by now that it is not console related. We will keep you updated very soon. Thank you very very much for your help, really! I beat the game today. You can see the black line that sometimes appears in the Soul meter, does not effect anything. I love the third stage the black background looks so good. I does not matter if Ninja looks like he is floating sometimes (boots same color as background). I do get a shimmer effect with the Magenta surface when moving perhaps due to LCD TV, but its just so awesome looking. I've beat the game twice. On third run through, guess what I see? Boss flame shot. 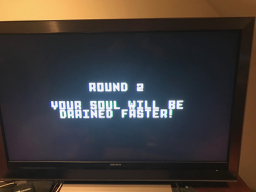 I played through three rounds and never saw any boss flames. I didn't rush the boss battles either, so they likely didn't end too soon for them to trigger. So you beat the game 2 times, saw the ending twice, and then started your third run through the game and didn't see boss with flame shot? We have located the issue and solved it. We are just double checking everything. The issue was that there was a small difference between the LTO and the game cart. Basically, the LTO initializes the cartridge ram by setting it to zero, but the game cart does not, so I have to do it manually. The game carts contain random values on the cart RAM and those values make the game to have invalid variable values, causing some games to experience some issues others not, if the relevant variables contain a valid value within the range of the game. The game was tested only on LTO during development since I live in Spain and also I can't flash the game cartridges, only Joe can. 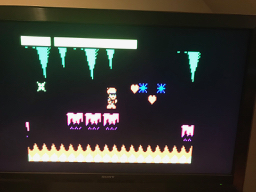 When the game was finished it was tested on the game cart but since only some carts contain invalid values, the test checked ok.
As I said, each game cart contains random variables, so some can experience small issues, others will not. The most common issue we have seen causes the bosses not to fire flames, making the game easier. Naber Hood games has halted the sales until everything is double and triple checked. Elektronite will post how to handle any necessary returns shortly. Edited by Kai_Magazine, Tue Mar 5, 2019 6:04 PM. I played through 9 bosses in one session. I was actually going to compare the rom on LTO to the cart version last night on several systems, but stopped when I saw that you'd already tested enough for Kai to conclude that the game must be the issue. I'm just glad that the it has been definitively narrowed and that it's just the cart, so I can play without issues on the LTO. It was already one of the most fun Intellivision games to play. So you finished the game 3 times in a row, and each time is harder than the previous one! Sir, you are definitively better than me at this game ^_^! I am very happy that you guys like it enough as to play it so much! Edited by Kai_Magazine, Tue Mar 5, 2019 6:58 PM. Getting past 3-1 on third pass is an issue for me. I'll try again, but is it rather difficult. 3-2, 3-3, 3-4 are much easier. Sounds like I am going to be glad if the bosses dont throw flames at me anyway! The first round was tough, but then it felt natural after that. I was using a Sega Genesis pad though. I didn't really notice the increase in soul depletion, so it's possible that it was off as well. Wonderboy is one of my favorite games and the ways that Ninja Odyssey is distinct from it really compliments the base of Thio's Odyssey. I'm hoping to free up an hour or two this weekend to record a play through of at least three rounds. This is definitely one of the times I wish I had a fancy arcade-style controller rather than 'stock'. My hands are *still* sore and I've taken a whole day off from playing it! How do you use a Genesis controller with the Intellivision? ?